Trackpads are great in that they do so much more than a simple mouse does. You can use gestures with different combinations of multiple fingers to pinch, tap, scroll, & swipe. 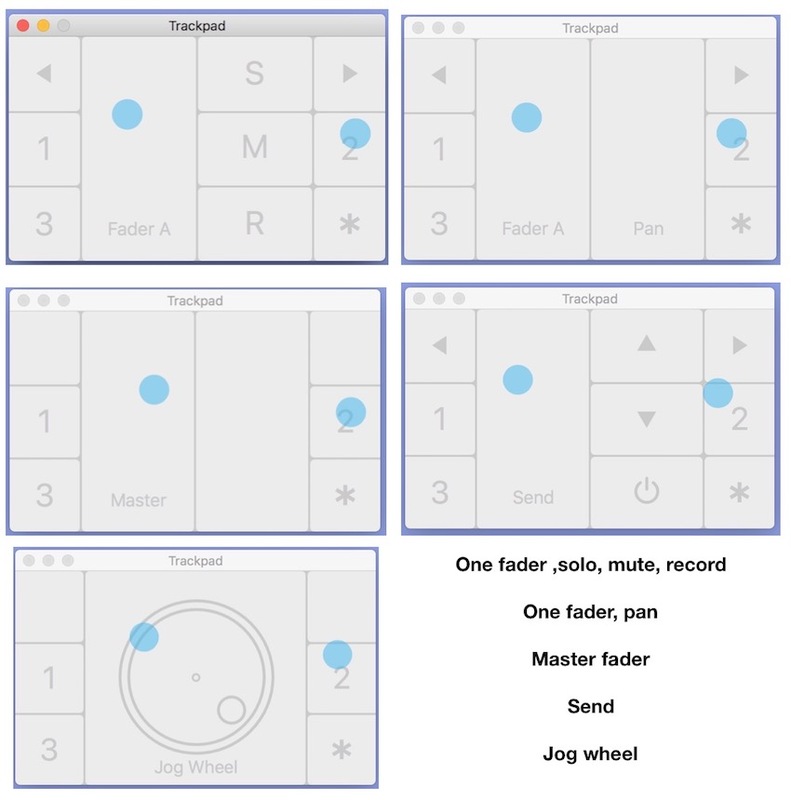 AudioSwift 2 is an app that enhances these basic functions, optimizing them for use as a control surface with various DAWs, including Logic Pro X. If you don’t have an iPad Pro or a Slate Raven, you can still join the party and participate in the tactile world of touch control! After some initial setup, which is shown in full detail here, AudioSwift 2 will work in five different controller modes and divide your trackpad into multiple zones. There are many ways to toggle AudiSwift 2 taking over your trackpad. I found the easiest to be a simple four finger tap to turn it on, and a four finger swipe to turn it off. Switching between the five modes is easily accomplished either in AudioSwift 2’s on-screen console window, or using the numbers one through five on your keyboard. Let's take a closer look. Working with a mouse is perfectly fine. But many DAW users crave more interactive control when altering parameters over time. The AudioSwift 2 Mixer mode has several different mixer sub-modes to handle a variety of common situations. The trackpad is divided into zones and is easily understood by enabling the on-screen AudioSwift 2 trackpad representation. It took me a while to get familiar with the tactile memory of where the different zones are. Once accustomed to it though, the on-screen representation is no longer necessary. The main mode is used to control a single fader, along with the solo, mute, and record enable functions. Left/right bank zones at the top allow for easily moving through a large mixer setup. Alternate mixer modes allow for control of fader and pan; send levels; master fader and jog wheel to navigate Logic’s timeline. X/Y mode is fantastic for real-time control over multiple instrument parameters with one hand as you are playing in parts with the other. It also has several different views; dividing the trackpad into different combinations of X/Y controllers, and virtual sliders sending MIDI messages. In the main view, each X/Y zone is fully configurable, sending user-defined CC or pitch band messages, with a choice of various relative and absolute modes. They can be configured to respond to either one, two, or three finger movement. Step through the different views using the comma and period keys on your keyboard. With an X/Y pad already setup and built into each preset, this is a natural fit with Alchemy. Logic’s MIDI learn function works easily enough with other instruments. 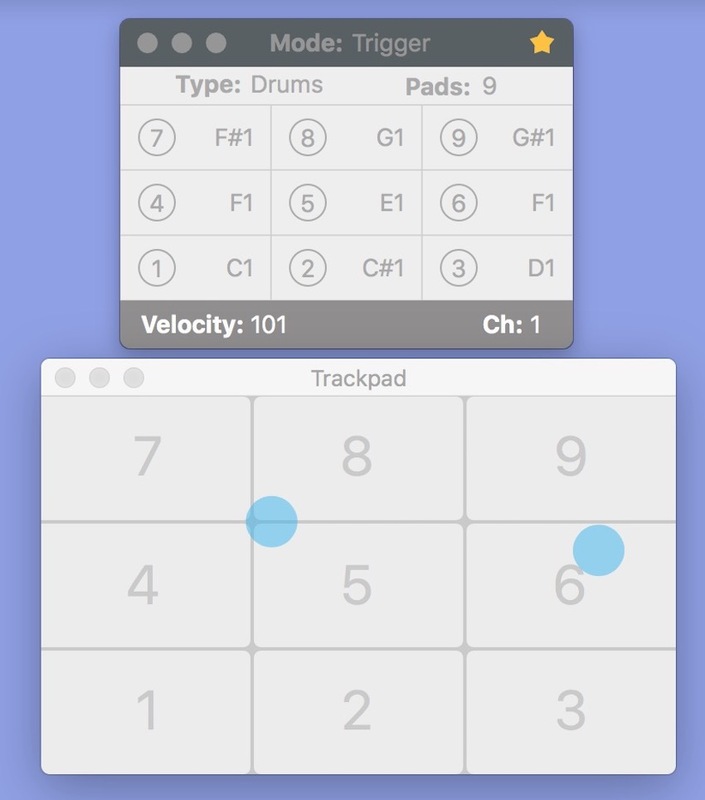 Trigger mode lays the trackpad out as a grid of either 4, 6, 9, or 12 pad zones for easy multi-note triggering. It’s got two modes; Drums and Keys. The obvious implementation for Drums mode is programming drum beats. And it is brilliant for this. It requires little to no additional setup if you want to use it with stock drum mapping layouts like Drum Machine Designer. Custom mappings are a snap, as each cell is easily programmed to trigger any custom note number simply by dragging up or down in it. Notes are triggered at a constant, user definable, velocity; which is great for dance music programming. The up/down arrow keys on your keyboard can be used to adjust the velocity value without having touch a mouse. Keys mode enables AudioSwift 2 to respond to note duration. In other words, how long you keep your finger held down in any specific zone determines how long the note will be held. Sliding from one zone to another feels and sounds natural as well. Force touch trackpads additionally send aftertouch messages when pressed harder. It's great having this degree of responsiveness to your gestures. Scale mode is more fun to play then you might initially think. There’s very little setup or learning curve involved. Simply choose a tonic note and a scale type, and the trackpad is divided into zones for each scale degree. Tapping and sliding from note to note feels great and allows for very expressive playing. As with Trigger mode, force touch trackpads allow for the addition of aftertouch message. But the real bonus is that the trackpad responds to multiple fingers. So you can play harmonic intervals and chords, all confined to the chosen tonality. It’s great for experimenting. Serendipity allows for the creation of interesting chords you might otherwise not have chosen or thought of. 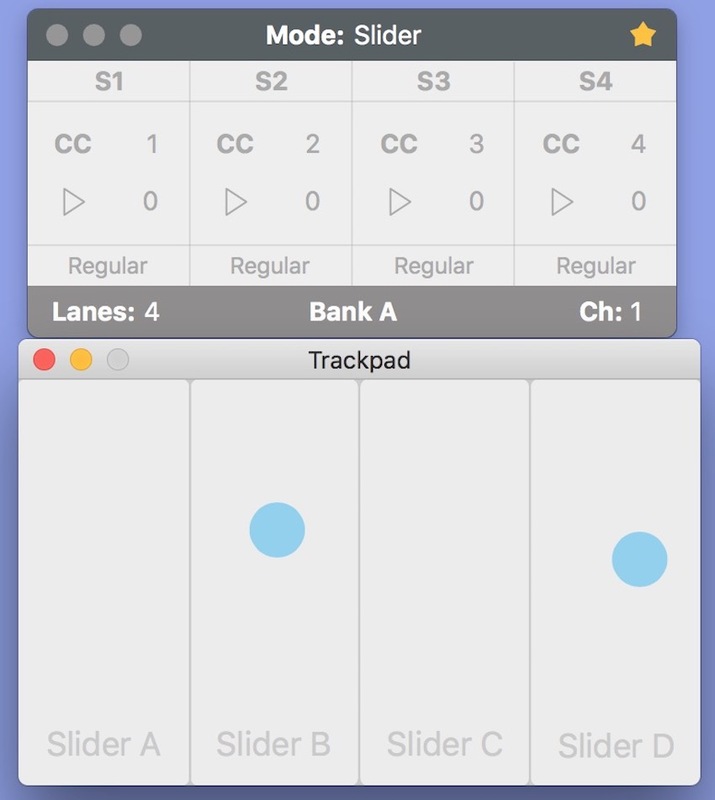 Use this mode to dive deep into CC and pitch bend messages by dividing your trackpad into up to three banks of 1, 2, 3, or 4, fully customizable lanes. This is the perfect mode to control expressive software instrument parameters and automate plug-in parameters. Up to three sliders can be controlled at the same time. As with X/Y mode, Logic’s MIDI Learn function is used to assign each lane. Each lane can be named, which is important when you are talking about up to 12 individual lanes. Specific CC values can be set along with a choice fo relative or absolute formats that control the movement of the destination parameters. 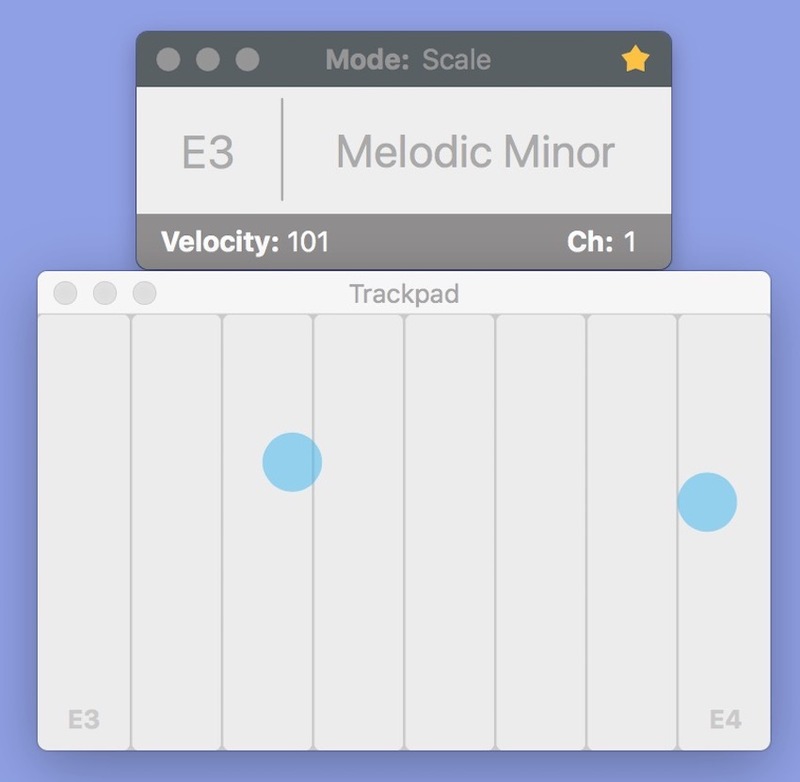 In regular or absolute mode, AudioSwift remembers the last MIDI value that was sent by each slider. No matter where you start within the virtual throw of your trackpad lane, it will pick up the remembered value and start the movement from there. The relative modes scale the MIDI data sent, depending on how fast you move your fingers. I think the obvious first question on everyone’s mind is, how does this compare to Logic Remote on either an iPhone or iPad. First of all, AudioSwift 2 is a heck of a lot less expensive than either of the above-mentioned iOS devices, even including the price of buying an Apple trackpad, if you want to use it with a tower, iMac, or Mac Mini. More importantly though, the further I dug beneath the surface of AudioSwift 2, the more I realized how much customizability and power it offers. Logic remote is perfectly fine, however, AudioSwift 2, with its ability to tailor CC messages for custom control over instrument parameters makes it perfect for users seeking deep real-time control over their software instruments. This means synth tweak-heads and orchestral musicians who want to control multiple performance parameters of sophisticated synths or orchestral libraries in real time. This solution is a fantastic choice in both these scenarios. This is a power-user app and not intended, in my humble opinion, for casual intermittent use. It took me a while to develop the tactile muscle memory of where the zones changed. A trackpad, after all, is just a little over 5” x 4” in size! Plus there is a fair bit of a learning curve if you want to get the most out of this app. Most of the modes have multiple views and parameters to set and control. So there is a bit of investment required to really feel comfortable using it. AudiSwift 2 offers fantastic support. There are deep dive videos on each of the modes on their website. It’s not a complicated program to learn, it just requires a bit of time and forethought to figure out how to best integrate it into your workflow. There is something to offer for everyone. If you’re into mixing, there’s deep integration with Logic’s mixer. If programming beats are your thing, you’ll enjoy using Trigger mode. X/Y and Slider modes are great for deep real-time control. And Scale, well, it’s just plain fun to use a trackpad for MIDI note input! There is a free demo of AudioSwift 2 that I highly recommend Logic users (with trackpads or trackpad equipped hardware) check out.